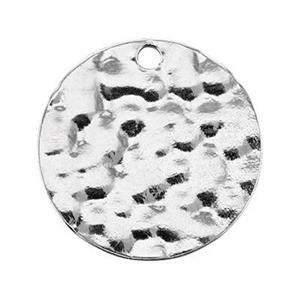 Sterling Silver 14mm 22 gauge Hammered Sequin Blank, 1.3mm Hole. Can be stamped. Hammering It All Out! To discuss until you reach a solution or agreement! We Agree to Agree - that our S10016 – Bright, Cast, Sterling Silver 14mm, 22 Gauge Hammered Sequin Blank – is a Beauty! And yes, you can stamp on top of the hammered design! Complete your Agreeable piece with one of our Finished Sterling Neck Chains.